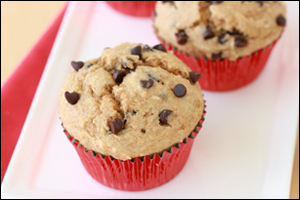 We've made chocolate chip muffins before, but never quite like this... Game-changing recipe ahead! In a large bowl, combine both types of flour, baking powder, baking soda, and salt. In medium-large bowl, combine remaining ingredients except chocolate chips, and whisk until uniform. Add mixture to the large bowl, and stir until just mixed and smooth. (Batter will be thick.) Fold in chocolate chips. Evenly distribute batter among the cups of the muffin pan, and smooth out the surfaces. Bake until a toothpick inserted into the center of a muffin comes out clean, 18 - 20 minutes. Enjoy! HG Alternative: If made with an equal amount of Splenda No Calorie Sweetener (granulated) in place of the sugar, each muffin will have 156 calories, 25g carbs, and 7g sugars (PointsPlus® value 4*). Muffins often get mistaken for smart alternatives to donuts and cinnamon buns. At the coffee shop, at your morning meeting... You assume it's a safer pick than the others. And in terms of a chocolate fix, you tell yourself, how much harm could a few measly chips possibly do? Wake up and smell the butter, sugar, and eggs, people! 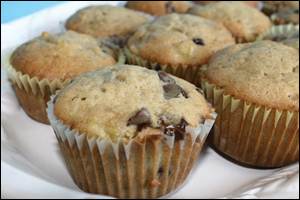 Chocolate chip muffins are generally loaded with fat and calories, thanks in part to obscene amounts of the ingredients we just mentioned. They're also often exploding with chunks of chocolate, and the muffins themselves tend to be massive! The stats below are for a midsized muffin, but as for the jumbo muffins sold at coffee joints, donut shops, bakeries, and cafés? You're looking at around 600 calories and 30g fat... sometimes more! That, friends, is completely unacceptable. So we took it upon ourselves to not only bring you a guilt-free recipe for chocolate chip muffins, but to bring you one that's better than any we've attempted before. This recipe serves up chocolate-studded muffins with the perfect texture and mind-blowingly delicious taste. Grab a seat, because you may pass out once you bite into one. (Safety first.) Happy chewing! Chocolatey treats you can eat for breakfast? Click "Send to a Friend" ASAP. It's the first day of fall, September 23rd. If you missed our pumpkin spice roundup, check it out STAT!